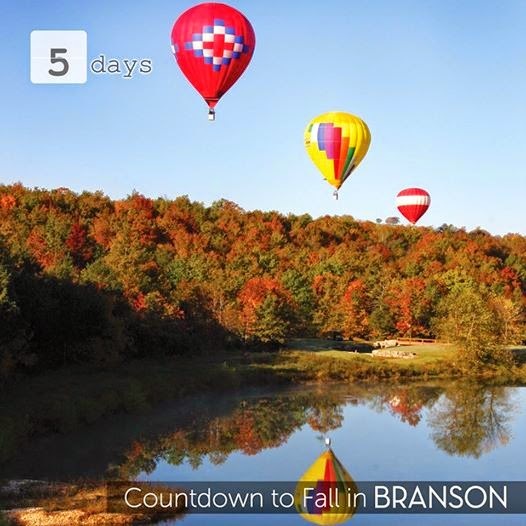 The countdown for fall started last week according to the picture, but I love this picture of Fall in Branson!! Trees have not changed just yet, but will. The weather is AMAZING this week in the upper 70's and low 80's, which makes for a PERFECT time to come to Branson. At Green Gables, we had a WONDERFUL summer with being fully booked every weekend!! We have THE BEST GUESTS in town! We also were able to show off our new breakfast room with the addition of Biscuits & Gravy and freshening things up around the Inn. Thank you again for an AWESOME summer and now we are looking forward to a busy Fall in Branson! Make sure to call ahead for reservations, as we had several guests this summer who showed up without making reservations, and we were full. Call ahead!